We’d love your help. 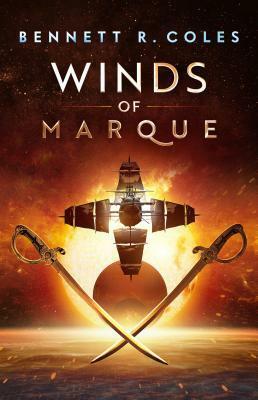 Let us know what’s wrong with this preview of Winds of Marque by Bennett R. Coles. In a dense star cluster, the solar winds blow fiercely. The star sailing ship HMSS Daring is running at full sheet with a letter of marque allow The first novel in an exciting science fiction series—Master and Commander in space—a swashbuckling space adventure in which a crew of misfit individuals in the king’s navy are sent to dismantle a dangerous ring of pirate raiders. To ask other readers questions about Winds of Marque, please sign up. 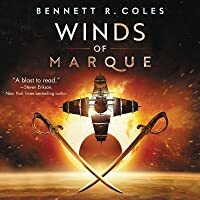 In the first of a new series (an eARC I received from Edelweiss), Winds of Marque follows the adventures of a navy in the future. It belongs to an empire where the nobles are the captains of spaceships no matter their ability (and quite often their ability is lacking). On the HMSS Daring Captain Sophia Riverton is a noble who has only been in the diplomatic corps before. She recruits our main character Liam Blackwood, a minor noble who has only held executive officer positions and he recruits a In the first of a new series (an eARC I received from Edelweiss), Winds of Marque follows the adventures of a navy in the future. It belongs to an empire where the nobles are the captains of spaceships no matter their ability (and quite often their ability is lacking). On the HMSS Daring Captain Sophia Riverton is a noble who has only been in the diplomatic corps before. She recruits our main character Liam Blackwood, a minor noble who has only held executive officer positions and he recruits a commoner Amelia Virtue as his quartermaster. They are working outside of normal naval operations, basically given a 'letter of marque' which allows them to go after enemies and keep any prizes themselves. Of course if they get into any trouble, the government will deny that they are affiliated. SPECIAL THANKS TO THE PUBLISHER FOR THE GIVEAWAY! Winds of Marque is fun. That’s what it seems everyone else who’s read it is saying about it, and a brief mention in the acknowledgments hints that “fun” was Bennett R. Coles’s chief goal. Considering that, it succeeds. Sort of. Our main character is Liam Blackwood, the chivalrous second-in-command selected to go on a spec ops mission aboard Daring under Commander Sophia Riverton. Along the way, he and Amelia Virtue (the quartermaster) are forced to SPECIAL THANKS TO THE PUBLISHER FOR THE GIVEAWAY! Our main character is Liam Blackwood, the chivalrous second-in-command selected to go on a spec ops mission aboard Daring under Commander Sophia Riverton. Along the way, he and Amelia Virtue (the quartermaster) are forced to deal with their growing feelings for each other. The book is told from both of their perspectives. Like all first installments, the book has plenty of difficulties to overcome. And like too many first installments, it doesn’t really overcome them all. First off, the reader has to become familiar with the characters. Authors struggle to give readers a good understanding of the characters while at the same time gripping the reader’s attention. This is definitely one of Winds of Marque’s problems. The pace winds up being slow at times, and even after two hundred pages the reader may find himself thirsting for more action. The book did promise swashbuckling pirate battles and whatnot, after all. But Coles focuses on integrating us into this new world, and may consequently lose some readers along the way. Sadly, Coles doesn’t exactly succeed at enveloping us in his universe. Instead of creating nuanced characters with subtleties that any human could relate to, Coles gives us characters that are a little too one-dimensional to really relate to. There are too few eccentricities, making all of the characters feel a little too normal to be real. Somehow though, his many characters still remain distinct from each other, and the characterization is just apt enough for the audience to care about them. But there is still a huge obstacle in our way to getting to know the characters: the formality that pervades the atmosphere. With a Canadian Navy background, Bennett R. Coles knows how to create a realistic naval setting. Sadly, we catch few breaks from the oppressive formality aboard-deck. Sure, there’s romance and the threat of mutiny (etc. ), both of which are very important subplots, but even in those circumstances the characters are not fleshed-out enough to offer much respite. All of the formality preempts any intimacy with Liam and the crew. Much of what is said is said “carefully”. This professional distance is kept throughout most of the book, making the slow pace even harder to bear at times. Granted, a lot of this Coles deemed necessary for the type of book he was writing. Ranks are respected, as well they should be. But it would’ve been enough just to get to know Liam better as the main character. However, we’re hardly told anything about his backstory, except that he’s a noble. There seem to be no scars from his past, or even anything from his past that defines who he presently is. Except for maybe his lower noble status that keeps him from being the Commander he so zealously wishes to be. What’s missing are the nuances, the subtleties that define great writers’ characters. The world-building is also frustratingly bare. We’re introduced to a brand new world, but Coles doesn’t do much to make it feel new. Science fiction is a well-trod genre, though, and Coles does well enough. Things pick up a little near the end. The action is okay, but not very high-stakes. Coles deals with some timely themes, crafting multiple strong female characters who are equal in every way to the male characters, and also injecting some interesting xenophobic elements. The opposition is lacking, however. I was craving a formidable villain, but the pirates in this book have no face: they’re just an army, and only a couple even have lines at all. The book ends with a promise of a dynamic villain in the future, however. And really, that’s the best thing about Winds of Marque. True, it’s fun, but the most comforting part is the potential in the sequels. Now that Coles is through with the hardest part, his series has a bright future. That is, IF he capitalizes on the potential. I'm a big fan of Bennett R. Coles and I was thrilled to receive an ARC. This is a new series, quite different from from his previous military SF. It's a swashbuckling space adventure and it was absolute fun. I got swept up into a universe evocative of old sailing ships, but in space - I didn't worry about the technology behind it, and simply enjoyed the ride. What I liked most, especially considering how this genre could lend itself to old-fashioned sexist and racist attitudes of the 18th century I'm a big fan of Bennett R. Coles and I was thrilled to receive an ARC. This is a new series, quite different from from his previous military SF. It's a swashbuckling space adventure and it was absolute fun. I got swept up into a universe evocative of old sailing ships, but in space - I didn't worry about the technology behind it, and simply enjoyed the ride. What I liked most, especially considering how this genre could lend itself to old-fashioned sexist and racist attitudes of the 18th century, was the presence of strong, complex and intelligent female characters who hold equal billing with their male counterparts. There was no agenda here, no real-world politics, just the presentation of men and women as equals in a fantastic, space-faring setting. This is a strange mix of technology and antiquated terminology. The mode of transportation is interstellar but cutlasses and four shot pistols appear to be the hand weapons of choice. The overall feel is Horatio Hornblower meets Hans Solo. This was an entertaining book regardless of the mixed messages sent by language and technology. Liam is an accomplished XO who is wondering why he isn’t yet a captain. Saddled with aristocratic officers, himself a minor noble, Liam chafes at their incompetence This is a strange mix of technology and antiquated terminology. The mode of transportation is interstellar but cutlasses and four shot pistols appear to be the hand weapons of choice. The overall feel is Horatio Hornblower meets Hans Solo. This was an entertaining book regardless of the mixed messages sent by language and technology. Liam is an accomplished XO who is wondering why he isn’t yet a captain. Saddled with aristocratic officers, himself a minor noble, Liam chafes at their incompetence. Tasked with a secret mission and a new captain, Liam and crew become privateers. An entertaining tale of naval adventures in space. This swashbuckling adventure does not differ much from naval/pirate tales of the past ___except for the welcome difference that women seem equal to men in power and character complexity. Ah, yes, and there is interspecies conflict. The technology is a bit clunky for a future space travel, but just go with it and enjoy the ride. This book is good for what ails you: pirates in space! You can tell how much fun author Bennett R. Coles was having as he created the story. The book is just plain fun, worth plopping on the couch and enjoying. It's funny, thrilling, and worth rereading. I need more of this, as soon as possible. Recommended to Loriann by: Goodreads! One of my students picked "Winds of Marque: Blackwood Virtue" up and signed it out of my classroom library. She brought it back to me and said that "it was a very good book." This would be a great book for sci-fi lovers. A total escape from what I normally read but this was a fun book! I enjoyed that women were placed in a place of authority and really liked the old and futuristic aspects. Building the series was apparent but it made me look forward future books. A fun and inventive mash-up of science fiction and high seas adventure. If you like old-fashioned pirate tales, steampunk, and/or space opera, you will enjoy. Authentic-feeling space navy action with a lot of twists that really kept me guessing until the end. Recommended for fans of Jack Campbell. Well paced adventure/space opera with good characters, fresh situations. Don't look for science that makes sense, but sit back and enjoy the fun.